Haha, the struggle is real! :) nice idea, would also be a nice fit for the meta game jam. Like how everything becomes very chaotic and you just try to finish something before time runs out. I was not quite sure what some symbols meant, that might be something to improve. However, nicely done. great idea! and very fun. good work! Because nothing highlighted on mouse over, I first thought it was animation, but really dig the idea. Once I figured out what was going on, really like the idea and minigames to fill aspects of jam entry etc. Whoo! I got a 96 and that felt good. It really captures the intensity of doing a jam while also having the deal with real life. I felt the only reason I got that 96 because I neglected my job and work. Fuego entry! Thanks for your words :D The game was a piece of my life in 64x64 pixels! And I'm happy to find so many people on the same situation! The tragicomedy of gamedev hahaha. Hahahaha, Yep, since the game session is short, I trusted that the players could play without tutorial. A little risky, but I could finish it quickly. thanks for playing and comment! PS: Work emails are my worst enemy! Something all of us finishing the jam can relate to! Very funny and well done! :D thanks! I love your spidey'ride game, it's great! I'm very happy to find so many developers in the same predicament! hahaha. I'm not sure what this was, but it was a nice experience. I got in total: 38.4, but I'm a bit impressed that I'm a coder and I got 0 zero points in this game ahaha. That probably explains why my entry is not that good ahahah. 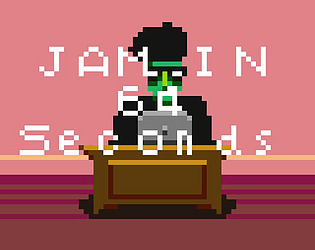 Anyway feel free to play it: https://itch.io/jam/lowrezjam-2018/rate/293637 and well done it's a nice idea.